Hello again! I hope you had a marvelous weekend and that your week looks even better. 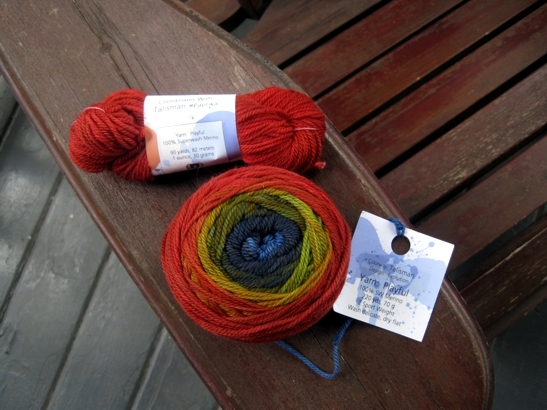 If not, please enjoy this photograph of luscious yarn. My weekend was less than marvelous and contained - well, not only no knitting, but not very much sitting either. I mean I'm used to things coming up or going wrong and generally taking more time than expected, but I had two rather large things go wrong, and they are taking rather more time than imaginable. Then in the middle of that I got some bad news about somebody I love. This on top of the other bad news for people I love, for which I have been taking some time to offer comfort. You know, business as usual for we crafty types. The upshot: I did no Hugs writing, and no Hugs photography, and so today's Hugs post is this one. Boring and whiny but the best I can offer. There goes getting my life back in 2016 and posting every weekday! I so enjoyed my two week run of uninterrupted daily posts, I can't tell you how much. If I can pop back again this week I totally will, because I do have lots of pretty little things to tell you about, but if not, please forgive me and hum whatever hold button music occurs to you. And please give yourself lots of small, happy treats and big, good thoughts because you deserve it! So sorry about your bad news, hope things will improve this week. I've been searching for that cue the music button for a few days now, but hopefully will all see our way through and find the warm comforting knitting projects waiting patiently for us. Please remember to take care of yourself, it's not always easy to do. Stay warm and dry, tomorrow always bring promise of a better day!